Distinctive features: Purple stem (but not always!). Grows in wet areas. Stem usually somewhat crooked (zig-zag). Relatively large sparse flowers, resembling those of New England Aster. 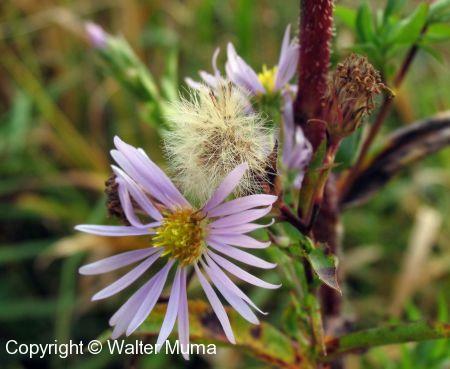  Rush Aster (Symphyotrichum boreale) - also grows in wet areas, but has very narrow, long leaves. 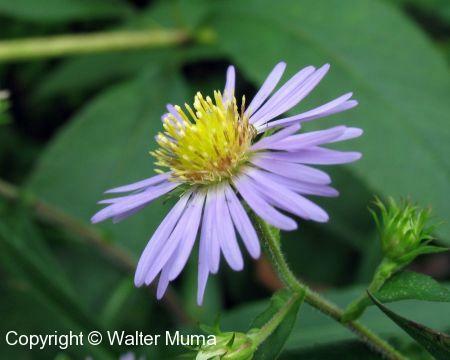  Smooth Aster (Symphyotrichum laeve) - may also have a purplish stem, but is smooth all over, including the leaves.  Bog Aster (Oclemena nemoralis) - also grows in wet areas, but usually has a single flower at the top of the stem. 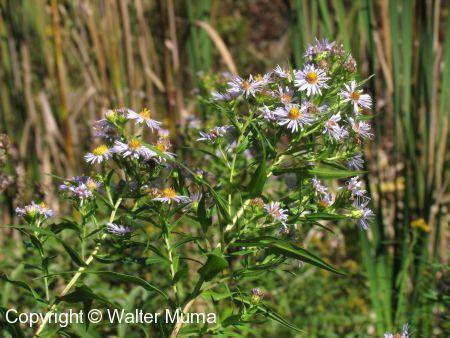  New England Aster (Symphyotrichum novae-angliae) - also has numerous ray flowers, and clasping leaves, but grows in drier habitat. Flowers: Summer, Autumn; White, Blue/Violet; 7 or more parts (petals); 2.5cm in diameter. Ray flowers: numerous: 30-50, pale blue, mauve, violet, dark blue, or purple. Disc flowers: 30-90, yellow becoming purple. 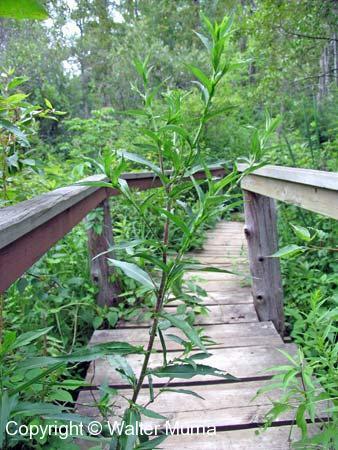 Leaves: Alternate, Simple, Entire; Gradually tapering to a base that clasps the stem, partially similar to those of New England Aster. Rough. Stem: Often reddish-purple (but not always). Usually bristly-hairy, but may be somewhat smooth. Fairly stout. Habitat: Fields and Open Areas, Wet Areas, Pond Margins, Marshes, Shrub Swamps, Moist Meadows; Swamps and open wet areas, wet thickets. 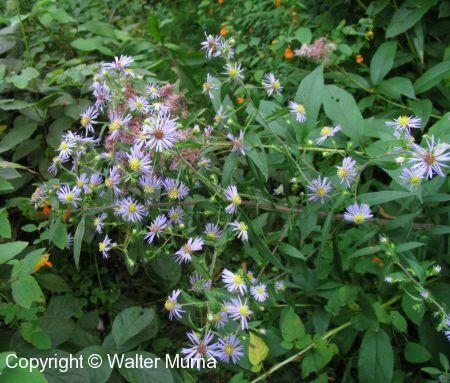 Notes: This Aster grows in wet areas and has an open aspect to it. 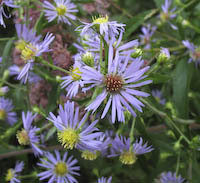 The stem is usually crooked, and the flowers resemble those of New England Aster. It is fairly common. Photographs: 360 photographs available, of which 15 are featured on this page. SCROLL DOWN FOR PHOTOGRAPHS. Note the typical disc flowers that start out yellow and gradually turn purple as they age. Closeup of the underside of a flower. Occasionally one will encounter a very pale mauve flower, as seen here. A photo of the top part of a plant. Note the cattails in the background. This Aster grows in wet areas. This photo shows the overall shape and form of Purple-stemmed Aster. Not all of the flowers on a plant will bloom at the same time. Here's one in full bloom while right next to it is one that has already gone to seed. 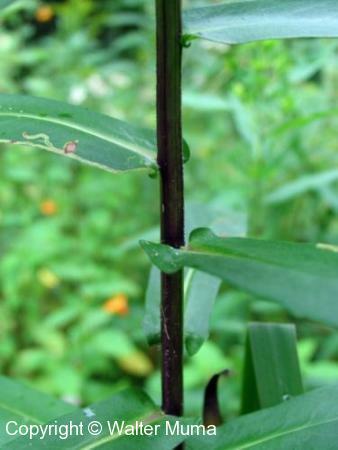 The typical purplish stem. Remember that the stem is not always purple, or just part of it may be pruple. 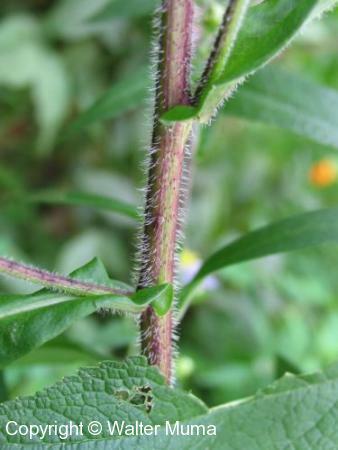 The stem is also usually very hairy, but sometimes is not. The stem is not always purple, either. 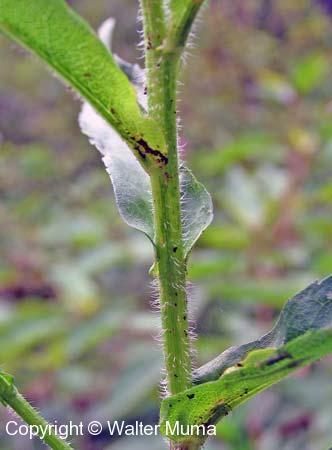 The leaves partially clasp the stem, resembling those of New England Aster (Symphyotrichum novae-angliae). The leaves are often smooth on top. A nice patch of Purple-stemmed Aster.